Very vigourous. 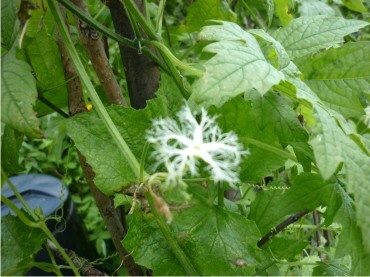 Grows to 6 metres height in UK. 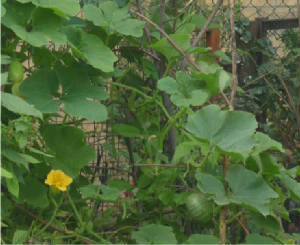 Harvest fruits for eating 4 weeks after setting. Hollowed dried fruits made into water containers and instruments (calabash). Shoots are cooked and eaten like spinach. Sow in April inside (eg windowsill at 18 degree C) for growing-on indoors in good light in 20cm pots to 120cm high for planting outside late May/ early June in prepared beds of rich, well drained,airy soil with lots of manure (on mounds of manure). Avoid root disturbance. Keep mature plants well watered and spray in hot weather to set fruits. Once flowers start, feed with high potash fetilizer every week. Grown in Sicily as well as Asia/Africa. Probably imported from North Africa. Grows to 4 metres high. 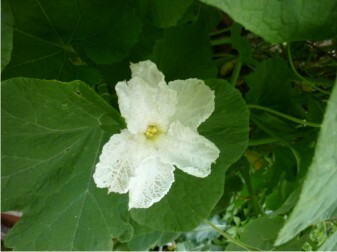 Flowers more prolifically than Bottle Gourd. 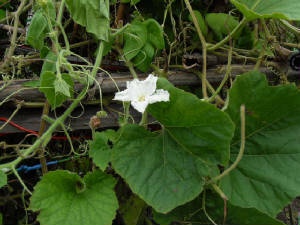 Fruits up to 2 metres long (either hanging vertically or snaking on roof of gourd structure). 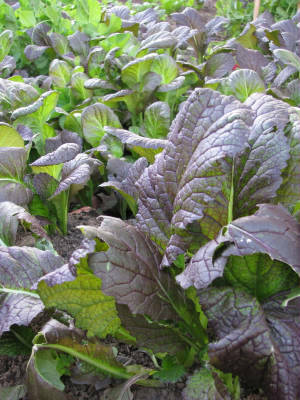 Grows to 3metres height (but beautiful dwarf varieties are available). Sow in March/ April on windowsill or greenhouse in pots/trays (one seed per pot to avoid root disturbance). Keep seedlings moist but not wet. Do not overwater in cold conditions. Transplant to prepared bed with one plant per cane or thick stick. 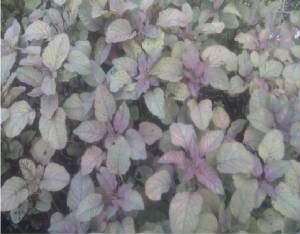 Plant dwarf varieties eight to a 40cm pot. 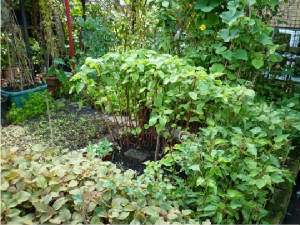 Needs plenty of light and sun and rich loamy water retentive soil containing organic matter (eg in double dug trench). Feed weekly with high potash fertilizer after flowering starts. Spray in warm weather to set fruits. 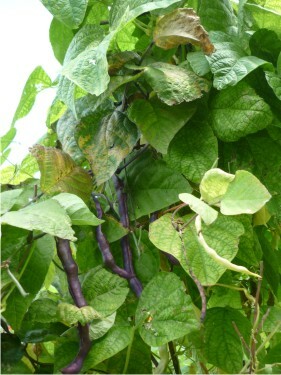 yardlong beans (Vigna unguiculata subsp. 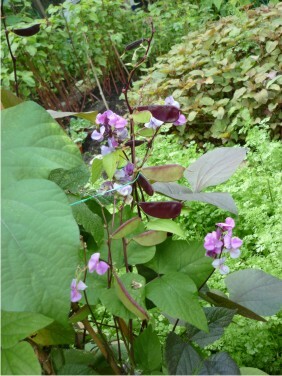 sesquipedalis) normally green but photo shows purple and white varieties. Soak the seeds in water the night before planting. In spring, sow seeds 6mm deep indoors two per pot and water well. Keep the soil moist until the seeds germinate.When seeds germinate pour liquid fertilizer over the seedlings, making sure to wet all of the leaves. Do not allow to dry out but water sparingly. 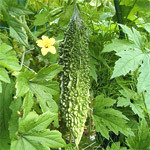 Plant out four to a 40cm pot and place in garden or greenhouse. 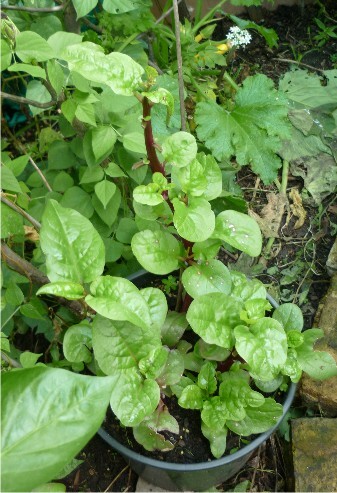 Malabar spinach doesn't have many pests or diseases. If the plant gets too big, simply cut it back. Can be overwintered indoors or in greenhouse. 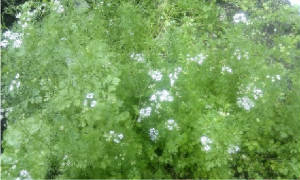 Grows to 1metre height either in dense beds or four to a 300mm pot. Requires sushine and warmth. 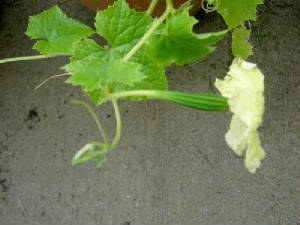 Leaves and tender stems are cut once plant is 30cm high and reshoot. Thick stems need peeling. Sow indoors in April in seed trays on light window sill. Fine seed germinates densely in a few days. Prick out seddlings three to a 30cm pot of rich, well drained soil (50% grit and crocks in bottom). Water well and shade after transplanting . Then place in sun and keep on dry side to encourage tap-root growth. Feed weekly with fertilizer. Alternatively, sow fine seed direct into prepared bed of fine rich loam in June and water well.